There are certain days of the year where a little girl needs to look her best. Like the day when school photos are taken. This is the dress for those days. This versatile pattern includes all the great details you look forward to seeing in our sewing patterns. Both views include a unique construction feature–a hidden kangaroo pocket at the front princess seams. S loves this because, she says, her hands touch when she puts them into the pockets. The dress is fully lined and has an invisible zipper at the back. You’ll be surprised at how easy it is to put in. As always, we walk you through the steps slowly and carefully. And if you’ve never sewn a zipper, you’ll feel a tremendous sense of accomplishment once you’ve finished the dress! View A (shown in the image below) has an elegant stand-away, rolled collar for a tailored look. 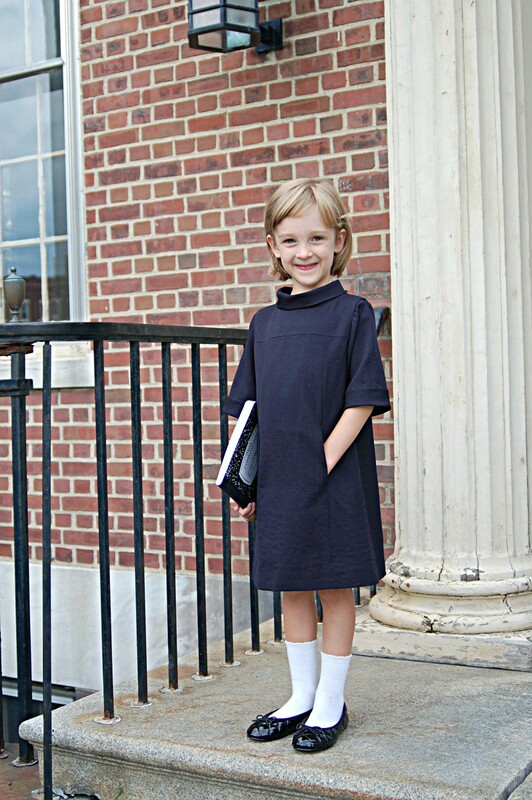 The three-quarter-length sleeves have a wide cuff to match the collar. I especially like this view with more feminine fabrics. The tailored style contrasts nicely with the fabric. 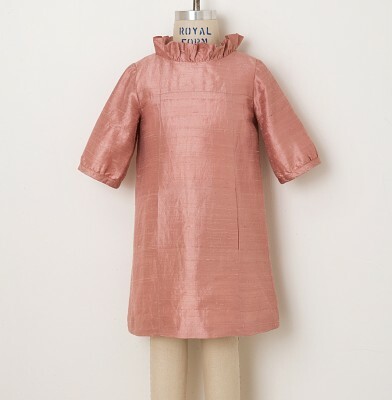 View B (shown at the top of this post and below) is a sweet, feminine version of the dress with a ruffled collar and bound, slightly gathered sleeve cuffs. This dress looks great in a wide variety of light- to medium-weight fabrics. As with most of our patterns, it works nicely with quilting cottons. But think about trying lightweight fine-wale corduroy for an everyday winter version. I sewed the dress S is wearing above as a school uniform for her. It’s made from a navy wool suiting (gabardine or tropical wool work well) to adhere to her dress code. For a dressy look, try silk dupioni, taffeta, or faille. I love it in this rose-colored dupioni. My little peanut is off to kindergarten this fall and I think I too will make her a school-uniform dress with this pattern! Thanks again for another fabulous idea. Oh, I liked that rose one. So classic. Oh, I just adore this pattern. I think it’s my favourite!! I must get some wool now. Thanks for the tip on lining fabric! And thanks (in advance) for making the zipper insertion clear and managable for us newbies! I’m so looking forward to making this dress this winter! Also meant to say that this will likely become my go-to special occassion dress! It’s so beautiful and elegant in the silk! This si adorable, I wish it came in grown-up sizes! Brava, Liesl – this is absolutely lovely. I love the 60s feel. And ditto motherof5 – I love her new haircut. That dress is adorable. I love it out of the wool, and I think that cord would make the perfect dress for the winter. I will be getting all of these patterns for my kiddos! Thank you so much for your great work on making patterns. Love it!! I’m planning to make Clara’s Daddy Daughter Dance dress with this pattern this year. LOVE the ruffle collar. Maybe a corduroy one to wear to school too. This is beautiful! I especially adore the rolled collar. Can’t wait to get my hands on the pattern! 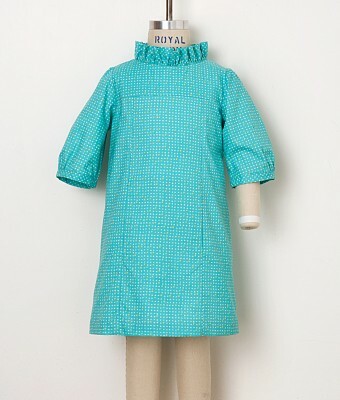 Ah yes, Petal (as S has named our dress form) comes with just one arm. Her official job is to help with developing patterns: fit, silhouette, etc. But she sometimes stands in as a model, since her measurements are much closer to real children than the mannequins we otherwise use. I like to see the length of skirts and sleeves on her arm and legs. So no second arm and no head. She’s really a working dress form, not a display form. Okay, I love this pattern! I’m currently a bit obsessed with RPL doubleknit for my work dresses and I’m thinking it would work equally well for View A of this dress. Hmmm, might be something I try this fall. I just love this and I can’t wait for it. It’s so retro and modern all at the same time. I have about 6 fabrics in mind for this dress. Maybe by September I’ll have decided which to use. 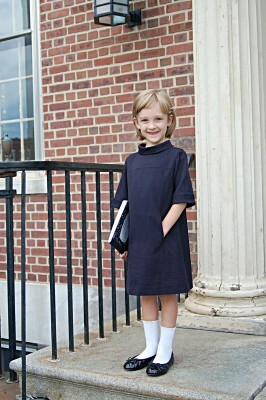 I love this style, especially after seeing it on S. I’m also loving all the uniform sewing with hidden “fun” linings. Almost makes me wish I was sewing uniforms. Love it! Just need to finish my 3rd and 4th ice cream dresses (one just about done, one cut out) and a jumprope dress promised to my daughter before this pattern comes out…the whole line up looks very strong this season. So excited about this pattern, just wish I could sew faster! I have a small piece of tropical wool in a tan/pink houndstooth that I wish to sew for Little One and I keep it out to look at, I think I may line that with pink silk/satin , I have a scrap ! Absolutely gorgeous. It looks so retro and adorable. I’d like a dress like this!! I love the idea of a heavy weight knit, but how would you line that? OMG!!! that is so cute. Looks like Jackie O in miniature! Wow!! I LOVE it!! It really is the best of simple and elegant. Great design.. I can hardly wait!! these are so amazing and lovely! i’m in love with them! Am also in love with this pattern. I would like to use gabardine or tropical wool as I have never used them so that would be a first. Can this type of material be washed? Whenever I look at the care instructions it says it is dry clean but I can’t image that anyone would sew day to day dresses for kids that require dry cleaning right? Any advice would be welcome.